Two of my best friends are engaged. I’ve seen them get fawned over in public by pretty much everyone: servers, cashiers, retail workers. I usually sit there feeling awkward when this happens. I’m not engaged. I’m also stumbling financially (thanks, student loans), so seeing them pay less for the same things I’m buying just because they have rings on their fingers baffles me. One lady had an idea, though: She pretended to be engaged to reap the benefits that come with it. Lisa Ryan’s article “I Faked Being Engaged for the Discounts” is quite the conversation starter. Ryan chronicled her experiences buying a fake $15 engagement ring and pretending to be engaged so she could get discounts on group exercise classes. According to Ryan, boutique fitness establishments offer bridal discount packages to help brides-to-be get in shape for their big day. To make it as believable as possible, Ryan even went as far as making a fake wedding page on The Knot. She was committed. Her fake engagement got her $100 off a membership to barre fitness classes. 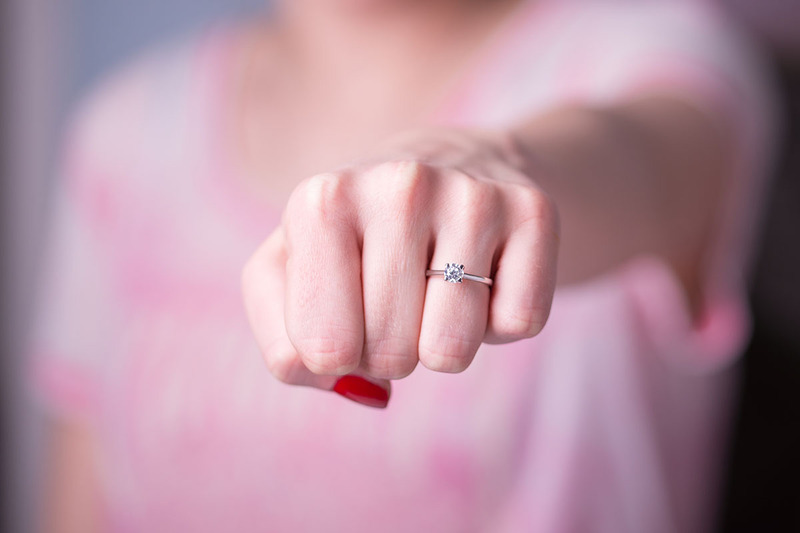 While a fake engagement could seem like a harmless, fun way to cash in on some discounted goods, some people might not find it so amusing. Branndon Coelho, lead developer at The Penny Hoarder, compared it to pretending to be a student or teacher or saying you’re in the military just to get a discount. In his eyes, doing that would would be looked down upon — so Ryan’s stunt should be, too. Gretchen Lidow, Pinterest specialist, felt a bit differently. She agreed that it probably isn’t ethical, but she found it amusing, nonetheless. “I actually think the whole extravagance surrounding weddings is appalling,” Lidow wrote. Is Our Obsessions With Weddings Out of Control? While it’s interesting that Ryan easily secured the $100 discount (all she did was call and say she was getting married), her experiences wearing her fake engagement ring bring forth deeper issues. The obsession with weddings in our society, in general, is a hot topic, and those who are married or engaged are often treated differently. Ryan describes interactions with complete strangers as suddenly full of kindness and genuine interest. Her recollection of a conversation with another woman at a fitness club about her “engagement” says it best. I’ve written before about the financial disparities single people face. However, while we aren’t showered with free gifts or handed tax breaks, we still save a bit because we aren’t forking over $35,329 on average for a wedding or a lump sum for a ring. However, Ryan’s casual willingness to fake her relationship status shows that the obsession with marriage is now falling outside of the soon-to-be bubble. She even goes as far as trying on wedding dresses and starts wearing the ring more often, even in places where she couldn’t get discounts. At one point, she describes watching the ring glisten when the subway car broke down. At first glance, this article is a humorous account of a single woman ridiculing society’s obsession with marriage. Taking a deeper look, though, shines a light on the pressure single people face in day-to-day life — both financially and socially. Ryan’s example of being treated more kindly by random strangers attests to this — what would they have said to her if she didn’t have a ring? Would they have even reached out to make a genuine connection with her? Also, would she have gotten free drinks at the bar if she wasn’t wearing her fake engagement ring? So, if you were quick to decide that Ryan was wrong for lying about her relationship status, you might want to reconsider: Is it really her lying that’s wrong, or is our obsession with weddings and marriage the real culprit here?